Insects represent about 60% of all known species of living organisms on planet Earth. 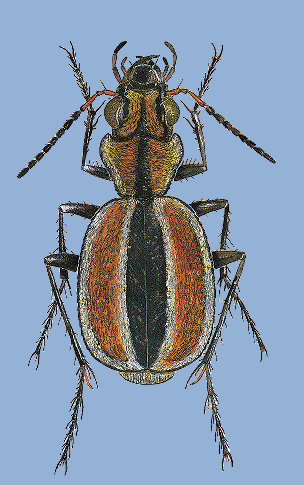 The Coleoptera or beetles are the most diverse order in the animal kingdom. One in every four animal species is a beetle! Among these, the carabids or 'ground beetles' are a megadiverse family with about 39.000 extant species known so far (January 2017). This website is based upon CarabCat, a global database of ground beetles developed and curated by Faunaplan since 1990. All data from CarabCat concerning species-group names (species, subspecies, synonyms, and including country distribution and some references) can also be accessed through the Catalogue of Life. Additional data that are not yet in the Catalogue of Life can be found by using the tools "Checklist" and "CarabMap" of this website. The aim is to facilitate and improve access to information about ground beetles which are an important group of insects both ecologically and economically. Copyright: Licensed under Creative Commons (BY, version 4.0).